Boxes for large Y-Frame trailer? Combining gardening and cycling! When I'm not out cycling, I'm busy working in the garden. The latter activity often involves long treks around the place with a wheelbarrow, transporting weeds, freshly made compost, prunings, etc, from one place to the other. 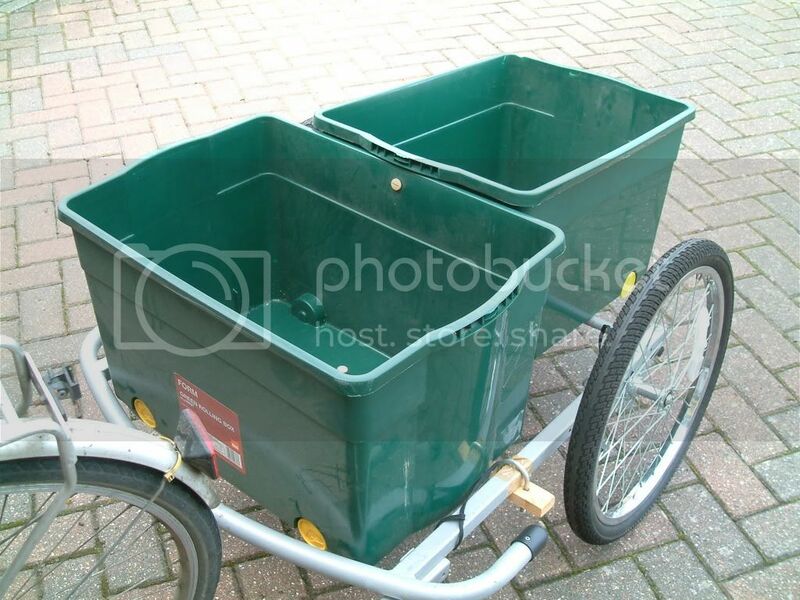 I already use my Y-Frame trailer for trips to the garden centre for compost, wood bark and cement (causing many a puzzled look from the cashiers when they say, "you can bring your car over to the door to load that up" and I reply "It's OK, I haven't got a car" - now they know me for the crazy guy that I am). 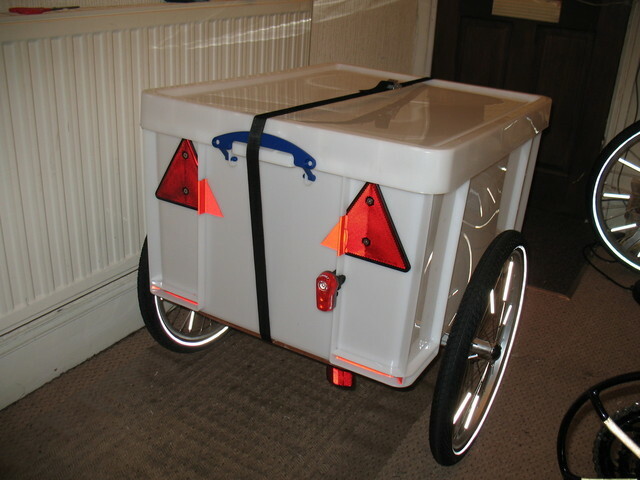 However, I have been thinking of ways round this and extending the role of my trailer. Does anyone use, or know of, a source of large plastic boxes, about 800x600mm footprint, preferably robust and strong enough to be used as a garden trailer? Carry Freedom does describe one of the boxes they recommend but it folds and therefore is probably not up to the job. 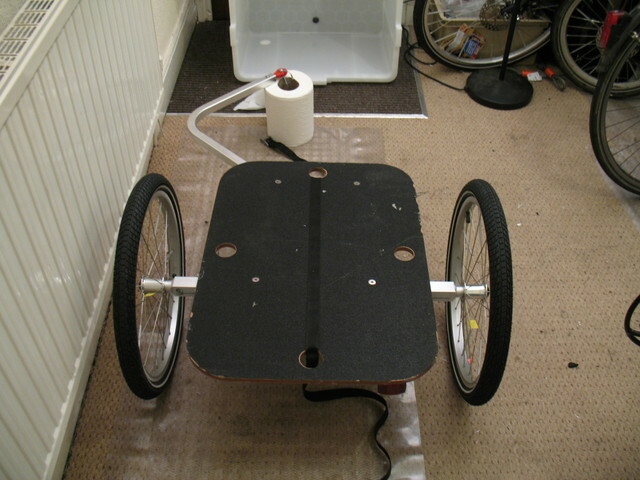 BTW, the box will be towed behind a trike so the load bed will be nice and flat when loading. 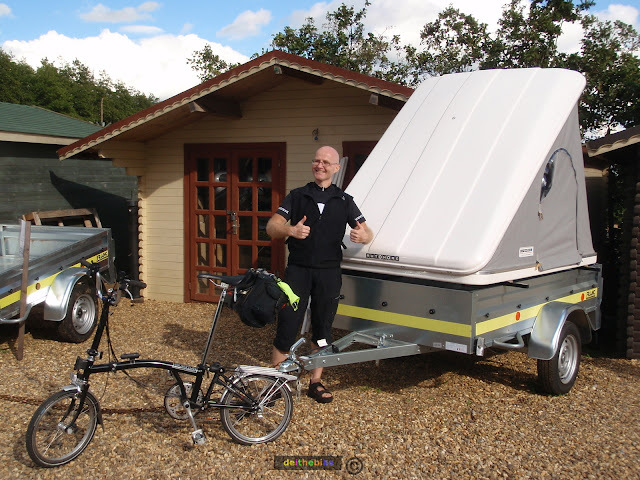 Re: Boxes for large Y-Frame trailer? Combining gardening and cycling! 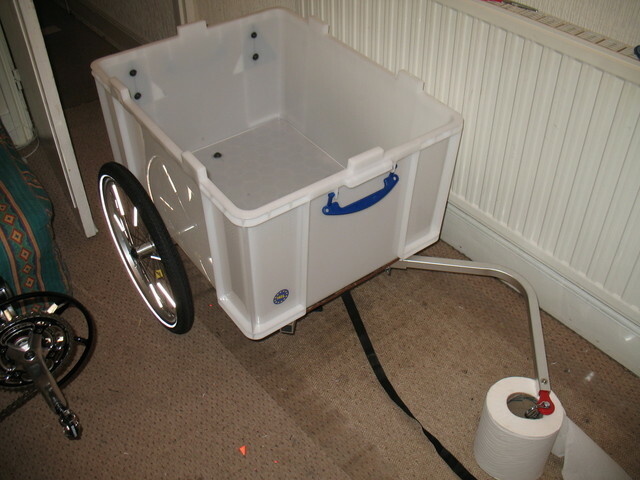 On my trailer (which was a Burley kiddie trailer or something similar before I took off the seat part), I went into B&Q and bought 2 large plastic boxes about those sort of dimensions, and bolted them down onto the flat bed. I'll try and go some pictures tomorrow. The forum software only shows the first part of the thread title. I thought this was going to be "Boxes for large Y-Fronts"
On my latest trailer I used a 'Fish box - the sort that they send fish to market in. I was just opening the thread to post the same observation. How long until there's a "Threads that seem more interesting when the subject is truncated by SMF" thread? You mean like "I need some tips for better fuchsias" or "Does anybody else love the taste of warm shitake mushrooms"? BTW, The other reading I had at first when I say this particular thread subject truncated was "Boxers or larger Y-Fronts", which I thought was a fashion advice thing. These boxes are about 50 cm x 38 cm, but B&Q had larger ones available. Back on topic I later thought of a wheelbarrow bucket but was looking for a larger capacity than your average 100 litre wheelbarrow. How about a cold water loft tank? A certain Iggy and The Stooges song comes to mind. Actually the box on the Filibus looks exactly what I am looking for. Any information on much appreciated. Having just acquired a Carry Freedom Y Large, I've been considering the same question. Width is tight at 620mm, but not unworkable. There's an "extra strong" version, too, though Staples (who would otherwise be a good alternative to paying loads for shipping) don't seem to stock those. Similar to Adam I bought two recycling boxes with lids (which helps with rain protection) and used 8 plastic number plate bolts to bolt them to my large Carry Freedom Y-Frame. I even use a few spring bungees to further clamp oversize items on top of the boxes. Unlike Adam, both of mine sit sideways with the two lids being about the size of the trailer bed. I have done dump rums, supermarket runs, DIY store (eg. 80kg of concrete), general shopping, even taking Christmas presents to our family's Christmas get-together. All in all, adding boxes to a trailer makes larger loads much more practical. Kim, from my experience I would go for the extra strong. I don't know my plastics well enough but there is a plastic that shatters when stressed and one (polyethelene? What modern canoes are made from) that bends when stressed. Thanks for that - bloody good point, especially if you're going to be drilling holes in it and filling it with stuff. I'm currently weighing up the relative merits of a single large box vs a pair of smaller ones... It's one of those things that doesn't matter until it does. Indeed. And obviously a larger box will allow for things that won't fit in smaller ones. On the other hand, a pair of smaller boxes can nest inside each other and take up less space for storage. On the gripping hand, as barakta pointed out earlier, there's a good chance that the dismantled trailer could be stored inside an appropriately dimensioned larger box. 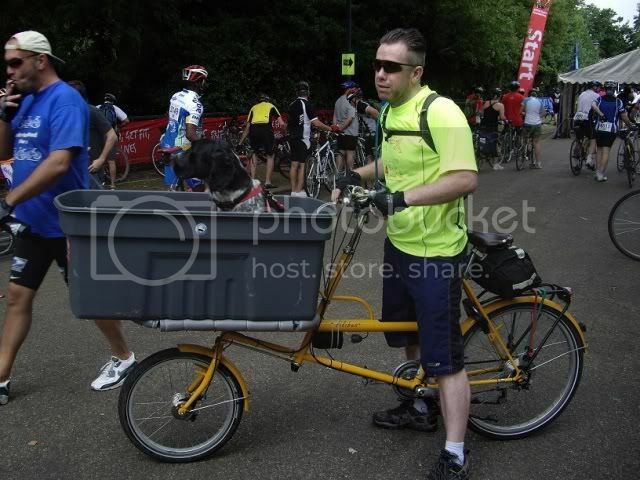 Combining cycling and gardening? Does that mean having a window box on your handlebars and doing some planting with your little trowel and fork as you ride? I don't see why not. Do it along a towpath to combine it with your third hobby as well: fishing. Okay, the 145litre Really Useful Box is pretty much the ideal size. This is the 'Strong white' box material, and it's the type of plastic that deforms and goes white with stress but doesn't shatter. It was easy to drill. The single ratchet strap is more that sufficient to hold the box securely in place, thanks to the feet. You can happily pick the whole thing up by the box and shake it. My measurements suggest that there should be room inside the box for the dismantled trailer, though I'm going to wait until the Sugru has cured before trying it. 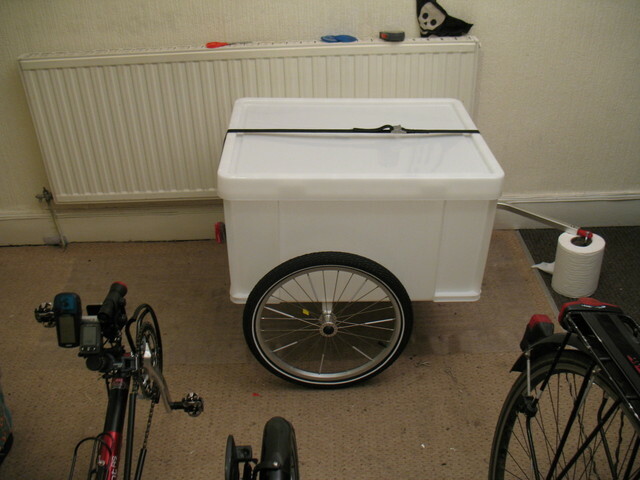 Externally, the box is 620mm wide, so should fit through doorways with ease, even though the trailer won't. I'm quite pleased with the result. This should be more than adequate for random shopping type stuff, and a large load space should make transportation of loose triffid cuttings to the tip a lot less hassle than trying to cram them into the naff plastic bags the council expect us to use for green waste. Good effort there Kim but still not quite got the jist of it!